Shri. 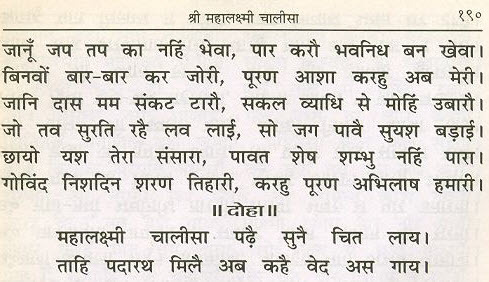 Sharad Upadhye suggests that devotees who recite this mantra every morning after taking a bath. 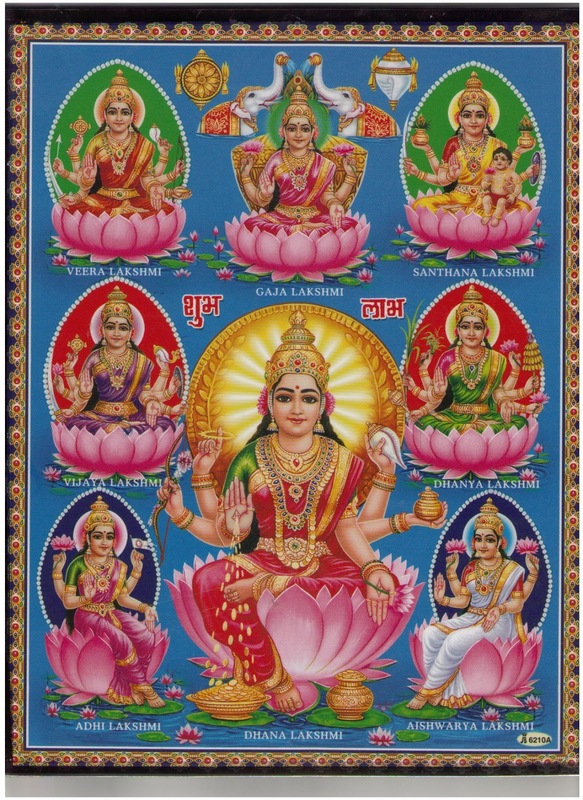 The following octet is called the Sri Mahalakshmi Ashtakam. Sri Maha Lakshmi Ashtakam is one of the most popular one recited. 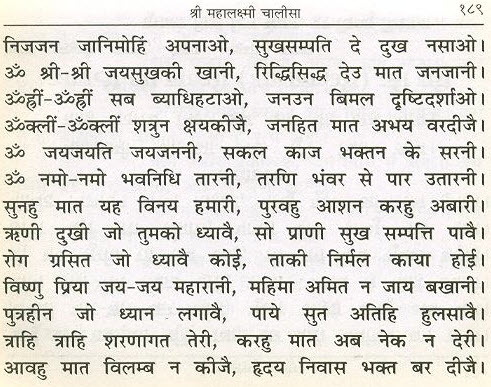 This stotra was first recited by God Indra in praise of Goddess Shri Lakshmi originally appeared in Padmapuranam (Padma Purana) propitiate Goddess Mahalakshmi. It is written in eight couplets and is and an octet hence got the name “ashtakam” in Sanskrit. This is a prayer to Goddess Maha Lakshmi who is also called “Shree” and represents wealth as well as auspiciousness. Reciting or listening Sri Mahalakshmi Ashtakam every day will benefit the person will be bestowed with success and worldly benefits. It is said at the end of this Ashtakam itself, that if always read once a day, great sins will be destroyed. If always read twice a day, wealth and prosperity will be ensured. If always read three times a day, the great enemy (ego) will be destroyed. Mahalakshmi will be ever pleased with that auspicious one. Namastheasthu Maha-maaye, Sri pithe, Sura-poojite, Shankha Chakra Ghadha-hasthe, Maha Lakshmi Namostuthe! Salutations to you O Great Maya, One who resides in Sri Chakra and is adored by the Gods, One who holds the Conch-shell, the Discus and the Mace, I worship to thee, Sri Maha Lakshmi. Namasthe Garudaarudhe, Kolaasura Bhayankari, Sarva Paapa Hare Devi, Maha Lakshmi Namostuthe! Salutations to the One who is riding the Eagle Garuda (Lord Vishnu’s vehicle). To the One, who destroyed the demon Kola Asura. To the One, who can destroy all sins caused by the mind, body and the soul. I worship to thee, Sri Maha Lakshmi. Sarvaghne, Sarva-varade, Sarva-dhushta Bhayankari, Sarva Dhukka Haree Devi, Maha Lakshmi Namostuthe! To the One, who is aware of everything in the creation, One who can fulfill all desires, One who is the destroyer of all evils, One who removes all miseries. I worship to thee, Sri Maha Lakshmi. Siddhi Buddhi-pradhe Devi, Bukhti Mukti Pradhaayini, Mantra Moorte Sadhaa Devi, Maha Lakshmi Namostuthe! To the one who bestows success and intelligence. To the one who gives liberation or Moksha (Salvation). To the one who is an embodiment of all Mantras, I worship to thee, Sri Maha Lakshmi. Aadhyantha-rahite Devi, Aadhya Shakti Maheshwari, Yogaghne Yoga-sambhoote, Maha Lakshmi Namostuthe! To the one who has no beginning or end, to one who the primordial energy of this cosmic creation. To one who is the divine fire born of all Yoga, to the one who is in the minds of the all Yogis, I worship to thee, Sri Maha Lakshmi. Sthoola Sookshma Mahaa raudre, Maha Shakti Mahodare, Mahaa Paapa Haree Devi, Maha Lakshmi Namostuthe! To the one who is the gross and subtle manifestation of Lord Rudra, to that ultimate strength who holds the entire creation within you, to the one who is the greatest energy of the cosmos and to the one who can eliminate all the hurdles of the progress. I worship to thee, Sri Maha Lakshmi. Padma-asana Sthithe Devi, Para-Brahma Swaroopini, Parameshi Jagan-maataah, Maha Lakshmi Namostuthe! To the one who is seated in the yogic lotus posture, to the one can assume the form of Supreme Brahman, to the one who is the supreme and universal mother of the entire creation, I worship to thee, Sri Maha Lakshmi. Shveta-ambara-dhare Devi, Naana alankara Bhooshite, Jagat-sthithe Jagan-maataah — Maha Lakshmi Namosthuthe! One who is clad in pure White clothes (Symbilic of purity, sanctity and truth), One who is adorned with many ornamentation, One who is the Universal Divine Mother of the entire Cosmic genesis of all time and space, and the Mother of all creation, I worship to thee, Sri Maha Lakshmi. 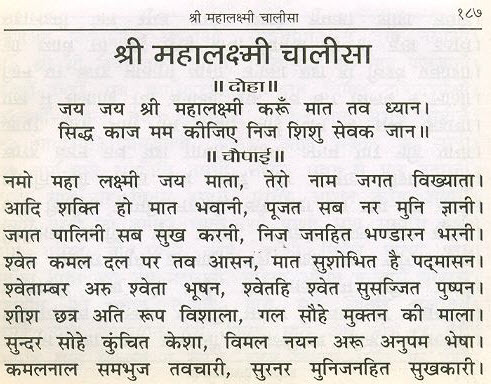 This page provides Sanskrit Lyrics with Hindi translation and video song of Mahalakshmi Ashtakam.